starch made from arrows; can (safely?!?) be eaten by spoonful. On its own, agar creates a Jello-like consistency, but adding in a slurry of water and starch (preferably arrowroot, though cornstarch works just as well, it's just more processed and the final product isn't quite as lustrous) transforms a dessert into something closer to a custard or mousse, which is what you're after here. Look for praline paste in gourmet or natural food stores. If you can't find it, try hazelnut butter (which is actually harder to find in my experience, but worth a shot). If you can't find that, you can try making your own praline paste. I've never attempted this but I see no reason it wouldn't work, though the final product won't be as silky as it would be with purchased praline paste (same thing with hazelnut butter). • Preheat oven to 350F. Oil a 9-inch springform pan; set aside. In a medium bowl, whisk together flours, baking powder, brown sugar, espresso powder, and cocoa powder. • In another bowl, combine canola oil, maple syrup, soy milk, vanilla, praline paste, and salt. Whisk until well-combined. Pour the liquid ingredients into dry ingredients, whisking together just until dry ingredients are completely moistened. • Pour batter into the oiled pan, spreading evenly across bottom. Place on center rack in oven and bake 20 minutes, or until the cake has begun to pull away from the sides and a cake tester inserted into the center comes out clean. • Pour water into a small saucepan and scatter agar flakes across the top, distributing evenly. Allow flakes to soften for 10 minutes. • Meanwhile, in a food processor, combine tofu, canola oil, maple syrup, salt, and vanilla; process until smooth. • Heat agar-water mixture until liquid comes to a boil, then lower the heat and gently simmer for 10-15 minutes, or until agar is completely dissolved. 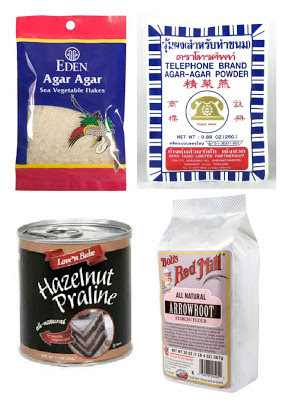 • Pour the agar-arrowroot mixture into the food processor; process until everything is thoroughly combined. Pour into springform pan over bottom layer. • Place the dessert in the refrigerator for at least 1 hour to completely set and cool. Run a knife around the edge of the pan. Release dessert from the springform rim and serve. A vegan blessing at that!